Last chance to enter for the free giveaway! The drawing will take place at 3pm (EST) tomorrow. The winners will be chosen by www.random.org. 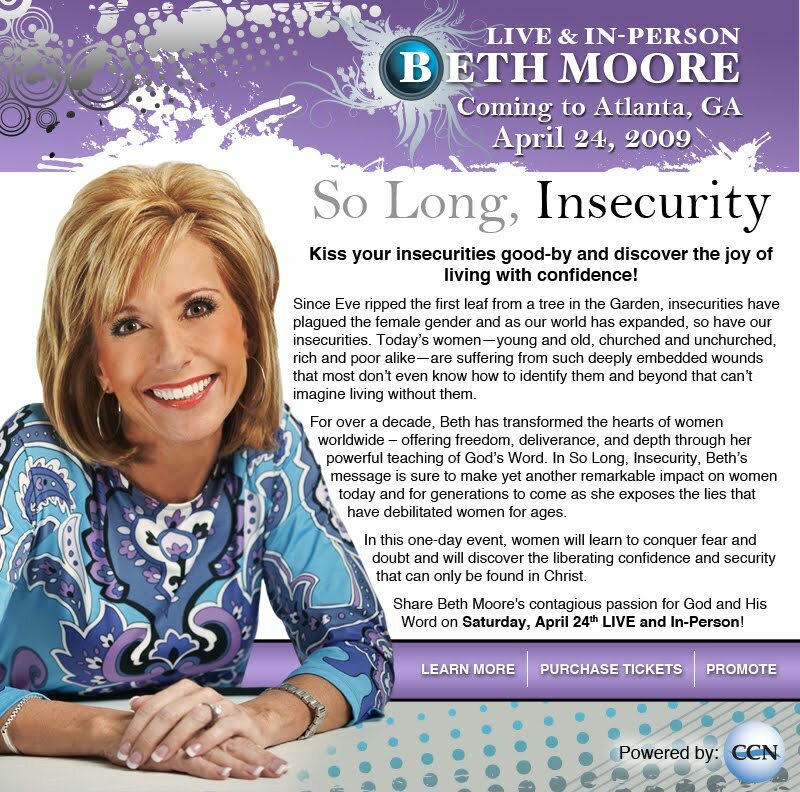 Please enter for your chance to win a pair of front row seats to the LIVE conference in Atlanta and a copy of Beth's book "So Long, Insecurity." The "So Long, Insecurity" book is now available separately. Please check www.BethMooreChristmas.com and click "order now." There is an option for the book alone on the order page. Beth will be doing a book/Bible study on her blog if you'd like to follow along. We are giving away two front row tickets and a copy of Beth's newest book "So Long, Insecurity." Please go to www.BethMooreAtlanta.com to enter! We will randomly select a winner on Dec. 15th. Also, please check www.BethMooreChristmas.com for a special offer this weekend only! Special Christmas Offer for Beth's Newest Book! This Christmas, bless all the women in your life with a special commemorative signature edition of Beth’s new book, So Long, Insecurity. It’s the perfect gift for your mother, sister, daughter, and friends. Women of all ages will resonate with Beth’s message that we can conquer fear and doubt and discover the liberating confidence and security that is found in Christ. PLUS – In December, your recipients will receive a beautifully-designed Christmas card that you can personalize and a gift certificate letting them know they’ll automatically receive the book as soon as it releases on February 2. 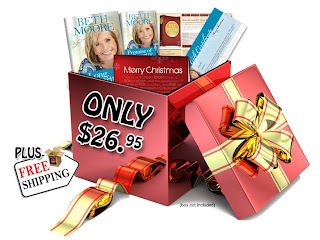 The price for the total package is $26.95 and it can be ordered from www.BethMooreChristmas.com. It has truly been an honor to speak with many of you these past weeks and hear the stories of how God has used Beth in each of your lives in a unique way. Thank you for taking the time to share with me and Kara. We have been and continue to be so blessed to be just a small part what God is going to do in Atlanta next April. We have a few requests, first of all, please PRAY PRAY PRAY!!!! Pray for each lady that will attend, that God will prepare her heart for the message that he has for her. Please pray for Beth, that she will hear clearly from God concerning the message she is going to bring. Ask that he bless her and her ministry, that he protect her and her family as she travels to bring God’s word in each of her conferences. I also ask for prayer for the So Long Insecurity event team. We are working diligently to make sure that all goes well, so each of you that attend will not have any distraction to hearing God and his word. We have one additional prayer request, please pray for 4 specific ladies, the one that will sit directly to your left, your right, in front and directly behind you. You may know who you will be sitting with, but even if you don’t, please pray for each of these daily. As I spoke with two different ladies this week, I was reminded that we have no idea what the person sitting so close to us is facing in her personal life that very moment, it may even be almost paralyzing heartbreak. Wouldn’t it be wonderful if each one that attends was told that day by those sitting near her that they had been praying for her daily for several months? Remember to pray for your LRFB! L(left), R(right), F(front), and B (back). The Main Sanctuary Is Completely Sold Out! We are sold out in main seating areas BUT we have Great News -- We have just opened a limited number of overflow seats in the Chapel, featuring the live broadcast from the sanctuary. Beth will come to the Chapel in person to greet the ladies seated in overflow. If you have friends who were not able to get tickets, make sure to let them know that they still do have an opportunity to see Beth live on April 24, 2010. They should hurry -- this will be their last opportunity to join the 9000+ ladies on the First Baptist Church, Woodstock campus. The energy at this event will be amazing. Remember, Beth will come to the Chapel and greet those ladies seated in overflow. Overflow tickets or lunches can be purchased at www.BethMooreAtlanta.com. We've done research on area hotels and negotiated group rates. Please see the recommendations below if you are traveling in from out of town! Please call to make your reservation and tell them you are with the “Beth Moore Women’s Conference at First Baptist Woodstock” to receive this rate. Note: The Hampton Inn and Comfort Inn in Woodstock are currently closed due to flood damage. They plan to fully renovate and reopen in December. Please mention “Beth Moore Atlanta” to receive this rate. 25 studio suites with 1 queen, 1 full size sofa sleeper $79 plus tax. Please mention “Beth Moore Conference at First Baptist Woodstock” to receive this rate.